For best experience, use DoggieDashboard on a computer or tablet. DoggieDashboard is free for the first 20 pets and 20 clients that you save in your database. Until you hit 20 pets and clients, it's 100% free. 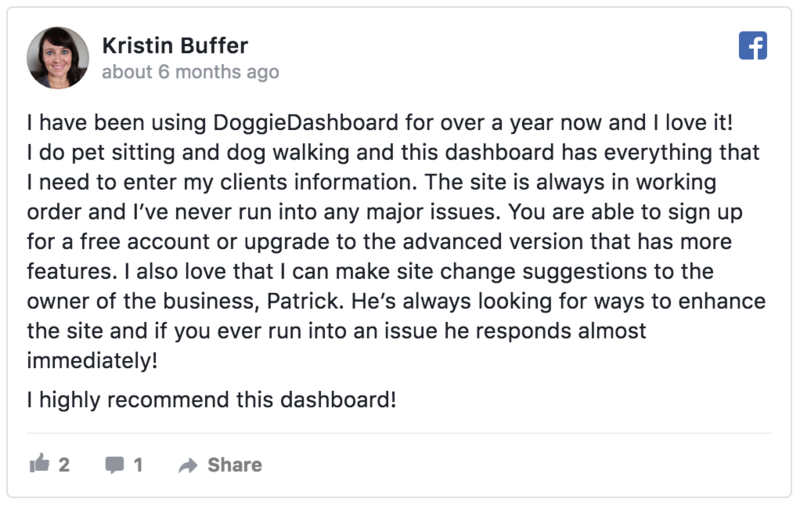 When your business grows past 20 pets and clients, you can decide if you want to upgrade to DoggieDashboard Premium (unlimited storage). If you decide to upgrade, DoggieDashboard Premium costs $25 USD per month. No contracts. No gimmicks. No hidden "per user" fees. Hello! I'm Patrick, the programmer who created DoggieDashboard. 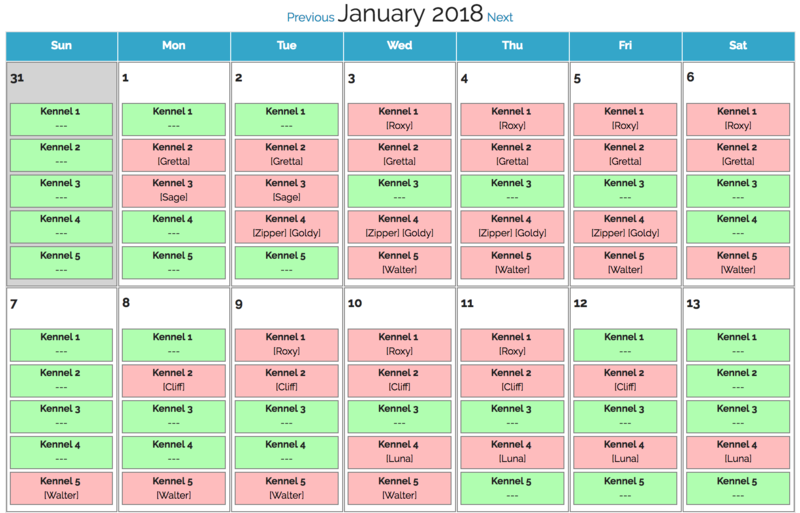 It started as a small project in 2014 and has grown to become a popular scheduling and management platform for pet businesses. DoggieDashboard has two versions: Free and Premium. The free version lets you save up to 20 pet records, 20 clients records, and 50 document uploads. DoggieDashboard Premium costs $25 per month and provides your business with unlimited pet records, owner records and document storage. Click the green button below to sign up for DoggieDashboard Free. Once you decide that you like using DoggieDashboard to manage your business, click "Upgrade" in your settings menu to unlock unlimited pet, client and document storage. You're in great company. 3,499 businesses are using DoggieDashboard to manage their business. Give it a try today! Would you like to give DoggieDashboard a test drive first? Click here to try it using the demo account. Why do you offer a free version of DoggieDashboard? It's simple. 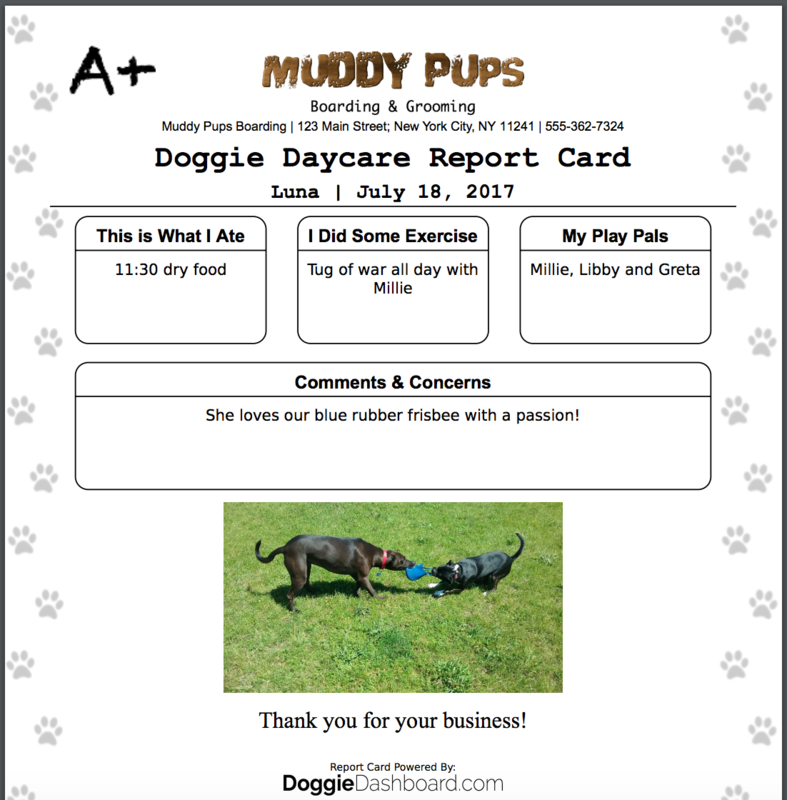 When I started DoggieDashboard in 2014, I relied on free software like Google Docs and Mailchimp to get the business rolling. Once DoggieDashboard grew into a successful business, I was able to pay for the upgraded versions of these services. I think the same rule should apply for pet care businesses. Use DoggieDashboard for free while you're starting your business. 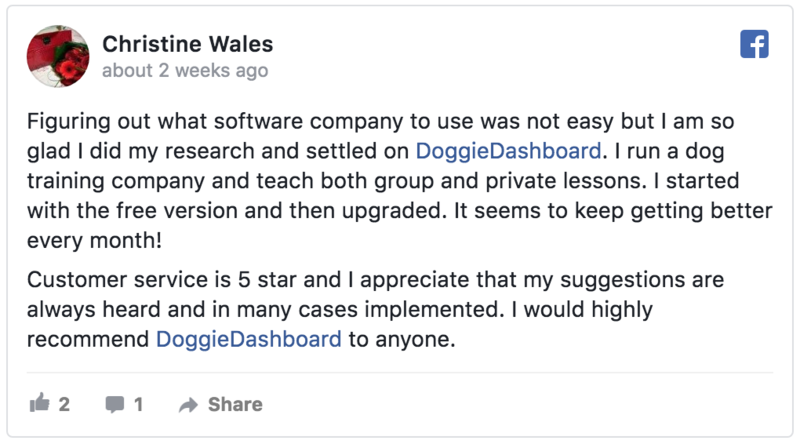 If your business becomes successful and you enjoy using DoggieDashboard, hopefully you'll be happy to upgrade to Premium. Yes, the only difference is that DoggieDashboard Free has less storage space than DoggieDashboard Premium. This gives you a chance to use the software before deciding to become a paying customer. Once you're convinced you like it, upgrade to DoggieDashboard Premium for $25/month. How long are the contracts for Premium? 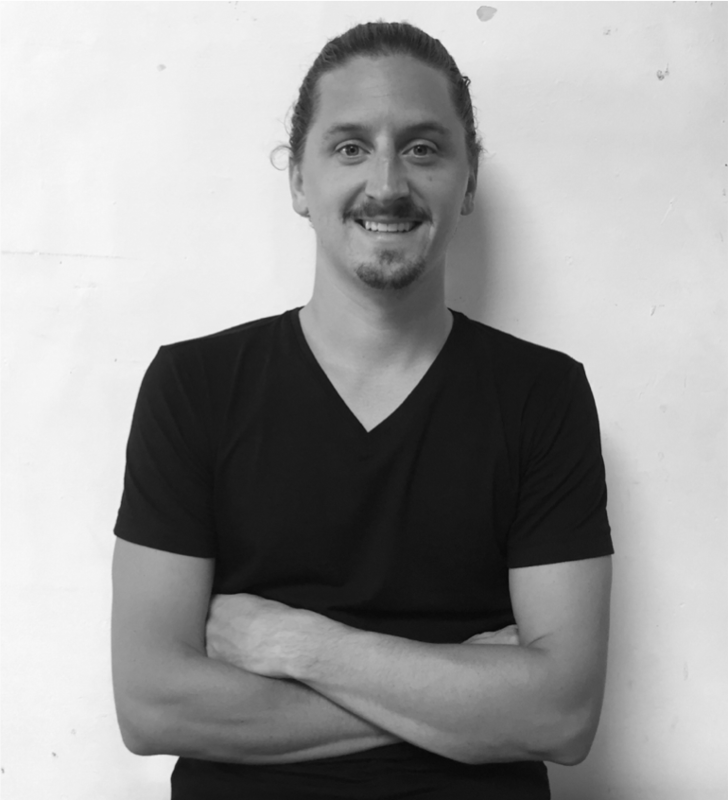 Software contracts? What is this, 1999? DoggieDashoard Premium is 100% month-to-month. 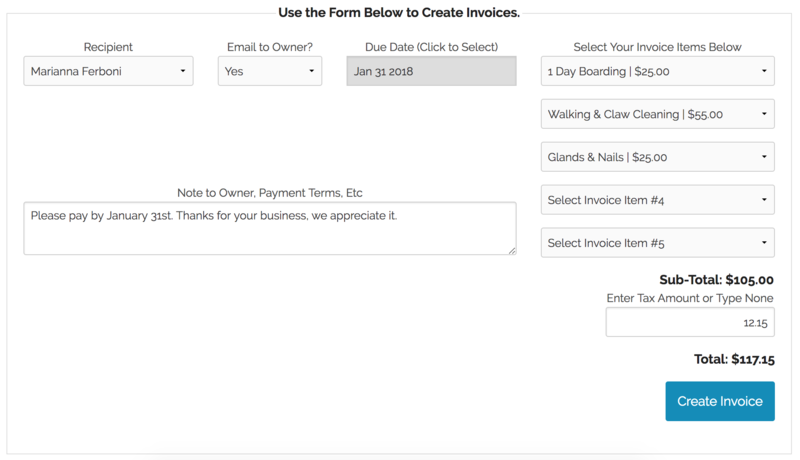 If there comes a time when you no longer want to use DoggieDashboard to manage your business, click "Cancel" and your account will be moved back to DoggieDashboard Free. There are no "app store" apps to download. DoggieDashboard is a cloud-based web app. That means you can use it on any internet-connected device, be it your phone, tablet or laptop. Just like using Facebook, if you're not connected to the internet, DoggieDashboard will not work. Can I import from my old software? Of course you can! To get started, send us an email support@doggiedashboard.com and include the export file from your current software application as an attachment in the email. We'll analyze the old export file and let you know how much of the data we will be able to import for you. Is my business information safe? Yes, 100%. DoggieDashboard uses Heroku.com for hosting and Amazon for storage. We all know Amazon. Heroku is a hosting company trusted by Toyota, Macys, Red Robin and over 4,000 other online applications. All DoggieDashboard data is backed up daily and stored at multiple off-site locations. Can I use it to manage my cattery? Yes you can! We've received this question quite a few times lately. Even though the software's name is DoggieDashboard, we like to think of it as pet-agnostic software. 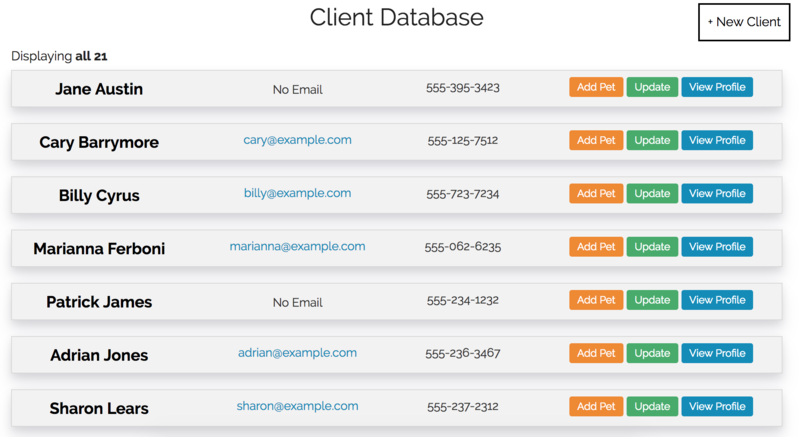 You can use it to manage any type of pet business. We even have a few users that manage reptile-sitting businesses. When you cancel, you will no longer be able to create any new pet or client records. If you attempt to create a new pet record, DoggieDashboard will ask you to upgrade. Can I export my data if I decide to cancel? Of course you can! It's your data, not mine. With the click of a button, you can export all your pet and client records into a tidy little Excel spreadsheet. Does DoggieDashboard work with other currencies? Yes. Businesses can configure DoggieDashboard to use any available currency. Simply update your currency in the 'Business Settings' menu. How many people can log into a DoggieDashboard account? DoggieDashboard allows multiple logins per account. That means you can be logged in on your phone and your computer at the same time. 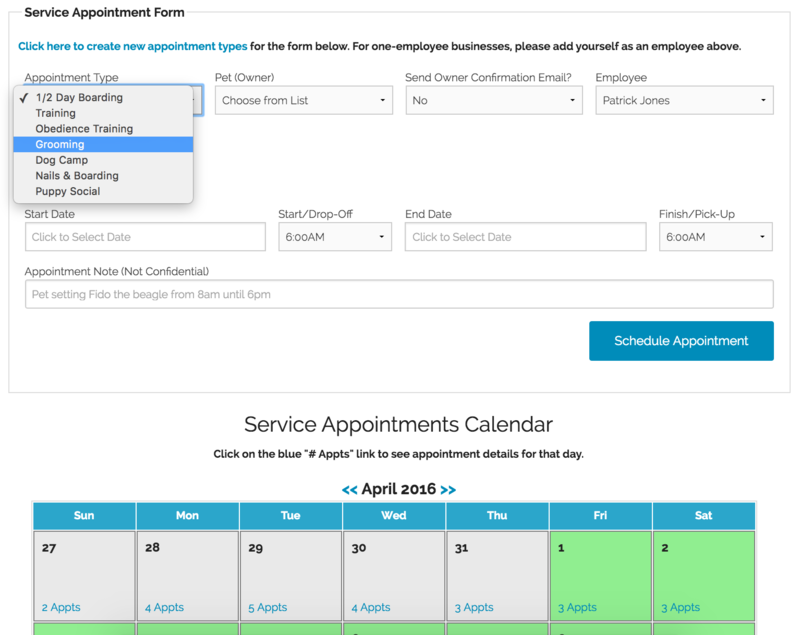 DoggieDashboard's free version is ideal for small businesses currently managing a handful of daily boarding and grooming clients. DoggieDashboard Premium provides growing businesses with unlimited pet, owner, and document storage. DoggieDashboard Free offers less storage. DoggieDashboard Premium has no limits! Two months free when you pay for a year! Interested? Try the DoggieDashboard Premium demo account. Ready to sign up? Click here to get started.